I recently dusted off this old City Group t-shirt – a treasured momento of the Non-Stop Picket that has travelled around with me for more than twenty years. The badges, t-shirts and other ephemera produced by social movements say a lot about the political ethics that they embodied. This t-shirt is no exception. It encapsulates the particular vision of solidarity activism that City Group performed through the Non-Stop Picket. “Brixton-Soweto: under attack, we fight back!” The slogan names Soweto, the sprawling Black township on the edge of Johannesburg in South Africa, alongside Brixton, an ethnically diverse working class neighbourhood in South London. For anyone interested in or familiar with the struggle against apartheid in South Africa, Soweto was synonymous with the school students’ uprising that started there in June 1976, protesting against the apartheid regime’s attempt to enforce teaching in Afrikaans (“the language of the oppressor”). As a place it was emblematic of the struggle against apartheid. In 1980s Britain, Brixton conjured up images of the riots that took place there in 1981 and again in 1985, responding to high unemployment locally and the racist targeting of local Black youth by the Metropolitan Police. 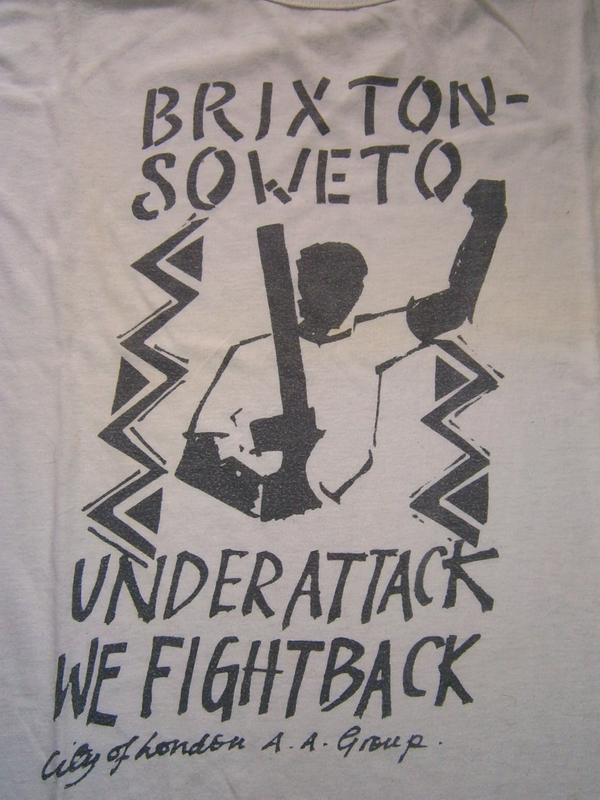 By linking Brixton and Soweto this t-shirt speaks to an understanding of solidarity work that was core to City Group’s activism. For the City of London Anti-Apartheid Group, opposition to apartheid in South Africa could not be separated from anti-racist work in Britain. By naming these two distant locations alongside each other the slogan points to similarities between the experiences of their respective populations. It draws out continuities in the resistant politics associated with both locations. (Inspired by Cindi Katz’s critical geographical work on globalization) I like to think of this slogan as tracing imagined political contour lines across the globe. In contrast to the global links fostered by corporate and political elites, the slogan articulates a ‘counter-topography’ that links equivalent struggles against racism and oppression across spatial distance. At times, infuenced by the politics of the Revolutionary Communist Group, slogans were chanted on the Non-Stop Picket that took this further – “Brixton, Belfast, Soweto – Under attack, we fight back!” or “Brixton, Belfast, Soweto – One struggle! One fight!” Here the contour lines of oppression and resistance are redrawn to link the struggle against apartheid with not only anti-racist activism in Britain but also the Irish Republican fight against the British occupation of the north of Ireland. For most of the young activists drawn to the Non-Stop Picket, the linking of anti-racist politics in Britain with the struggle against apartheid in South Africa was uncontroversial. It made sense. Drawing Ireland into the mix sometimes caused more discomfort. But these slogans and the counter-topographies they expressed opened a space for political debate and discussion. They were not just declarations of solidarity with distant others, they were discursive tools for reimagining what it meant to be opposed to racism and oppression. They were performative in (re)orientating activists’ solidarity work in new and multiple directions. This entry was posted in Archival research and tagged Belfast, Brixton, City of London Anti-Apartheid Group, counter topography, Geography, political slogans, political solidarity, political t-shirts, Revolutionary Communist Group, Soweto. Bookmark the permalink. I will never forget the time we were verbally attacked by a bunch of Israeli students who protested at the flying of a PLO flag on the picket. This was another symptom of our displaying of solidarity for situations linked to the racism/bigotry of apartheid. All the same and in particular obviously very relevant to the Israeli links with South Africa. Marvellous stuff and indicative of many a conversation we all had over the years with many a racist/bigot.